**** Out of Stock *** - BURNSIDE HAVE DISCONTINUED THIS MODEL. Most elderly and disabled people find handheld mobile phones impossible to use and yet many can still use an ordinary desktop telephone. The new Burnside P23 Desktop Mobile Phone combines the ease of use of a desktop phone with the flexibility of a mobile phone. 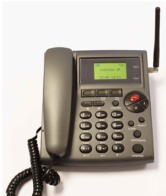 The big button P23 provides the ideal 'use it anywhere' telephone for use by those living at home, in hospital or care home or in any location without landline connection.